While many of our members are expatriate Austrians who have chosen to make the Greater Toronto Area their home, everyone is welcome to become a member or the Canadian-Austrian Society of Toronto. Whether you have roots in Austria or one of the countries often still referred to as former Crown Lands, or feel an affinity towards Austria and its culture for different reasons, if you are not already a member of our organization, we encourage you to consider becoming a member now. This way you will never miss being up-to-date on our important events, but you will also be aware of various cultural events in the GTA, which we consider of potential interest to our members. 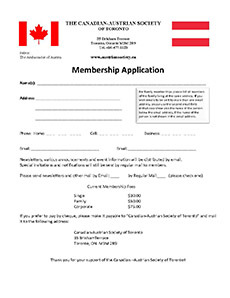 Membership in the Canadian-Austrian Society offers you a window into Austria and the possibility to meet Austrians and Friends of Austria at various events, such as excursions, theatre tours, receptions, movie nights, and occasional social events with special themes like Valentine or Christmas. While a command of German is helpful, to appreciate some of the literary and film presentations, it is by no means mandatory. We believe that we offer a sufficiently diverse program throughout the year, which focuses more on Austrian culture in general, and can be appreciated by all. We now offer you three convenient and secure online payment options for the annual membership fee. For payment with a PayPal account or credit card please select the type of membership that applies to you, then enter your telephone number below and click on "Buy Now". If you prefer to pay by credit card, click on "Don't have a PayPal account?" and enter your credit card details. If you have any questions, you can send us an email from the CONTACT page, or leave us a message in our voice mailbox, by calling 416-477-1123.